Last week, I received a call at school from Ward. He spoke some beautiful words to me - "your shoes are here". The torture! I wanted to call off class and head home right away and run. BUT, I couldn't. That sort of thing is frowned upon in high schools. So, instead, I asked him to send me a picture of my new beauties so I could day dream about how my run would be after school. As soon as I came home, I changed into my running gear as quickly as possible and slipped on my new Mizuno Wave Rider 17s. It was a gorgeous blue ski day. But rather chilly. No worries. Just bundle up and go for it. I knew I was going to warm up in about a mile anyway. And I did. First impression? Wow! There was enough cushion in the heel that the ride just felt so smooth. The toe box felt a little snug and shallow but it didn't hurt. I was hoping that after a few runs the shoes would loosen up a bit. I could feel the shoe hugging my arches and they felt quite supportive. Great lateral support! I did not run in the Wave Rider 16s at all, but did run in the 15s. But at that time I chose men's. 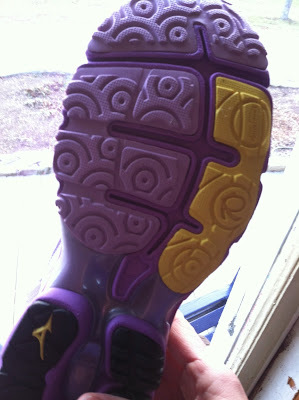 I liked them but I didn't like all of the seams in the upper and did not like the rigidness of the wave plate. However, the 15s did have a lot of support and were a pretty solid shoe that did get me through that entire winter. The sole had a lot of grip and I knew I wasn't going to slip around in the snow. This time, Mizuno opted for a lot less tread action on the bottom, which is okay with me. Also, the uppers do not have all of the seams going on. So there is a lot less chance of weird rubbing. The cushioning is also amazing. Great improvements, Mizuno! 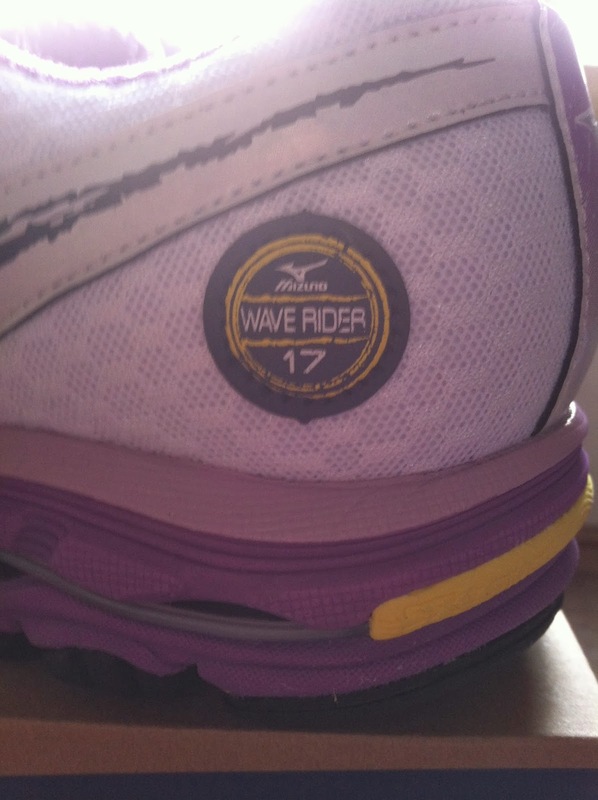 On Wednesday, I laced up my Wave Rider 17s again and headed to the gym. We had some pretty major downpour action going and Tucker was home - so I thought it would be best if I had him hang out at the gym while I got my miles in on the treadmill. This time I noticed the tightness on my right foot more than Monday's run. When I finished, I did notice a blister on my bunion. Not an odd place for me to get a blister. It's happened before. But when it's happened, I normally stop running in the shoes. I didn't want that that to happen! So, for the third run, I loosened the laces and wore my thinner socks. Not a single issue with rubbing or tightness. Either the shoes are loosening up or my changes worked. But it doesn't matter. I get to wear these shoes! Which makes me a happy girl because they really are pretty awesome! I've already run 19 miles in these shoes in a matter of 3 days. I see many more miles coming with them! This time I chanced it all and went for the women's wide. This is a pretty large gamble for me. I know Mizuno's run narrow. I also have to share that Mizuno does not make a lot of their women's shoes in wides. Which is rather disappointing to me. That's why I normally wear men's Mizunos, but I am not really liking the color options in men's shoes lately. 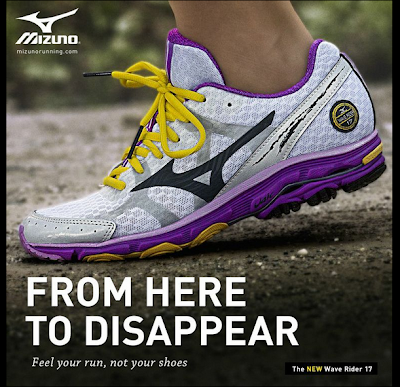 Now, for the technical details of the Wave Rider 17 from the Mizuno website. By the way. Be ready. These beauties will officially launch in stores on December 5th! Just got mine yesterday! Going to try them out today! I'm so excited! I've been wearing Wave Riders for about a year now and LOVE them! I'm glad that updated model is getting good reviews! tHANKS FOR THE REVIEW JEN! But FYI.... Wave Rider is available in a women's D (wide) width for you. I think that might fit you best! Oh me too!!! Wave Riders are pretty fantastic!!! I hope you get some!